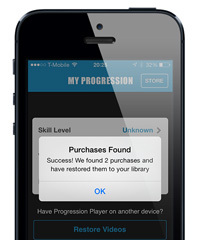 Just in the nick of time we’ve had our latest version of the Progression Player for iOS reviewed and accepted into the iOS App Store, all ready for the big launch of iOS 7 on Wednesday. Aside from iOS 7 bugs fixes we have also updated the interface to give it a more modern iOS 7 inspired look and feel. There’s nothing earth shatteringly different but we think it now fits nicely with iOS 7 and once you’ve spent a bit of time with Apple’s new operating system you’re gonna appreciate the apps which match its new design. Ever stop watching a video and come back later only to manually have to find the place you’d previously reached? 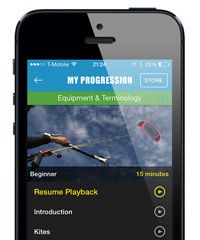 Resume playback remembers where you got to and allows you jump back and carry on immediately. This actually came from customer feedback, and had us kicking ourselves as to why we hadn’t added this before! So please keep letting us know what features you want to see in the Progression Player, we are listening. 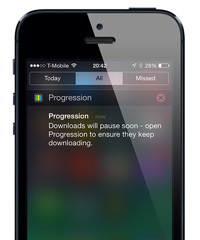 We’ve always had notifications to let you know when videos complete downloading but we’ve now adding a warning to let you know that iOS is about to quit the Progression Player and pending downloads will pause – allow you to jump in and ensure they keep going. We’ve fixed several bugs with the restore videos feature, making it easier to sync purchases between devices or simply get your purchased videos back on a device after re-installing iOS. We’ve also added a simply message to let you know the number of purchases that will be restored, hopefully helping those customers with multiple Apple Ids who can’t remember which they used to buy videos! We’ve fix an issue effecting devices streaming videos to an AppleTV using AirPlay, which caused the video to stop whenever the device went into low power mode. Videos will now continue to plays even if the device auto-locks. Plus we’ve fixed several small annoying bugs in what will hopefully making the app far more stable. And we’re only getting started! We are already working on the next version which will launch alongside our new Progression Player for Android (yep, it’s coming!) so lots more exciting things to come. And before you ask – new content is in the pipeline but more on that later. So download the update now from App Store. If you have any feedback, suggestions or criticism please let us know so we can continue to improve the Progression Player and help you make the most of your next session. Anytime, Anywhere.